Former White House press secretary Sean Spicer wants to minimize talk of divisions within the Trump administration after announcing his resignation. Sean Spicer is reportedly stepping down because he is unhappy with President Donald Trump’s appointment of a new communications director. However, he told Fox News he had “no regrets” about his six-month stint. Wall Street financier Anthony Scaramucci has been picked for the role that Sean Spicer had partially filled. The shake-up at the White House comes amid several investigations into alleged Russian meddling in last year’s presidential election and whether Donald Trump’s campaign team colluded with Moscow. “The president obviously wanted to add to the team, more than anything,” Sean Spicer told interviewer Sean Hannity. “I just thought it was in the best interest of our communications department, of our press organization, to not have too many cooks in the kitchen. Sean Spicer, 45, defended President Trump’s agenda, saying it was an honor and a privilege to serve him, and hit out at what he termed “media bias”. Sean Spicer also said he had told President Trump he “would stay on for a few weeks to achieve a smooth transition”, and was looking forward to spending more time with his family. 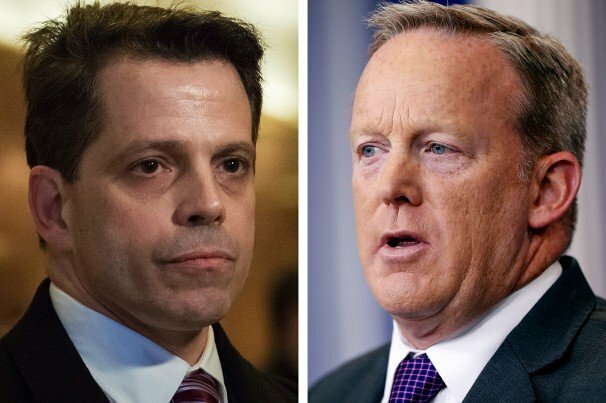 The New York Times reported that Sean Spicer had “vehemently” disagreed with the appointment of Anthony Scaramucci, which he believed to be a “major mistake”. Sean Spicer’s often chaotic press briefings over the past six months were a cable news hit, but in recent weeks he had withdrawn from appearances in front of the camera. In an assured debut, Sean Spicer attended Friday afternoon’s news conference to announce that Sarah Huckabee Sanders, formerly his deputy, would step into his shoes. Anthony Scaramucci, who has no previous experience in communications roles, paid tribute to Sean Spicer as “a true American patriot” and “incredibly gracious”. “I hope he goes on to make a tremendous amount of money,” he added. Anthony Scaramucci also apologized and said he had been “unexperienced” as he explained his previous criticism of Donald Trump. In an August 2015 interview with Fox Business, Anthony Scaramucci dismissed Donald Trump as a “hack” and “an inherited money dude” with “a big mouth”. Anthony Scaramucci is currently senior vice-president of the Export-Import Bank, a government agency which guarantees loans for foreign buyers of American exports. How Can Tensions in the Asia Pacific Region Be Addressed?